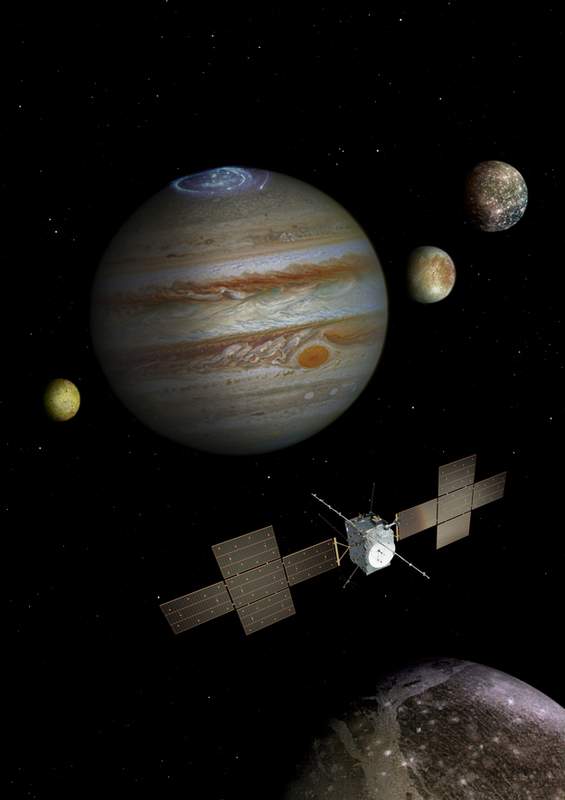 The next flagship mission of the European Space Agency (ESA) will be the Jupiter Icy Moons Explorer (JUICE). This probe will be launched in 2022 and will follow a Venus-Earth-Mars gravitational assist trajectory. It will enter into Jupiter orbit in 2030. JUICE will study the jovian system for about 4 years with a suite of 10 instruments, among which the Submillimetre Wave Instrument (SWI). the adopted trajectory proposes about 50 jovian orbit (including ~10 inclined orbits), two Europa flybys, and about 30 flybys of Ganymede and Callisto. JUICE will eventually enter into a Ganymede orbit. The science objectives of the JUICE mission are detailed on the ESA JUICE webpage. My work, as ESA Working Group Lead, consists in coordinating the scientific preparation of the observations of Jupiter with the MAJIS, JANUS, UVS, 3GM and SWI instruments, with L. Fletcher (University of Leceister). We study the best observation and synergistic science opportunities. We regularly produce reports for ESA. More information on the science preparation of the mission can be found on a dedicated ESA webpage. JUICE trajectory segmentation example to optimize Jupiter observations.